Lancaster High School 1992 graduate and Texas Christian University (TCU) track alumni Brashant Carter was among a group of six athletes being inducted into the TCU Letterman’s 2018 Hall of Fame at Amon G. Carter Stadium. Carter was a two-sport athlete at both Lancaster High School and TCU lettering in both track and football. 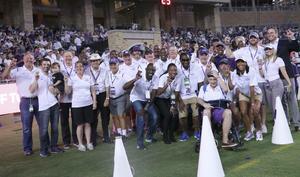 Lancaster, TX/Lancaster ISD – As the 1992 Lancaster High School graduate and Texas Christian University (TCU) track alumni Brashant Carter stepped out of the tunnel at TCU’s Amon G. Carter Stadium and joined a group of six athletes being inducted into the TCU Letterman’s Hall of Fame, he began to reminisce on his journey from high school to college. Carter was a two-sport athlete at both Lancaster High School and TCU lettering in both track and football. He remembers clearly how his coaches Greg Williams (then, his football coach), David DeBorde (then, his track coach) and Coach Beverly D. Humphrey made a great impact on his life. During his days at Lancaster as well as at TCU, those who worked with Carter say he was one of the hardest working athletes. They also gained respect for him on an individual basis. Coach Williams also said Carter was a hard worker and loved what he did as an athlete. This carried over to his performance. As a two sport athlete in high school, Carter recalled the intense commitment that it required. For TCU, Carter was a six-time All-American in men’s track & field and back-to-back conference champion in the outdoor 200m in 1995 and 1996. He was also the 1996 conference indoor champion in the 200m. He was a part of the 1995 4x100m relay team that won the NCAA Outdoor National Championship. 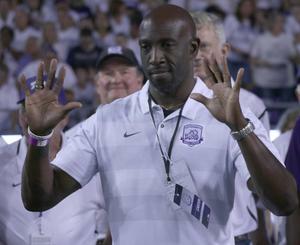 Carter was also a four-year football letter winner at TCU playing defensive back and wide receiver. Carter said he remembers very well the day he received the call that he was being inducted into the Hall of Fame for TCU. He said this is something he will never forget. During his days at TCU, Carter was also a two-sport athlete. He ran on the 4X100 relay team for track and played on the football team as well. He said he had to work closely with his football coach Pat Sullivan because he did not allow athletes to play football and participate in another sport as well. Carter said the toughest thing for him at TCU was not winning the 4X100 relay during his freshman and sophomore years. He said they had the lead both years and lost his freshman year in the anchor leg to LSU and dropped the stick his sophomore year. Carter still calls Lancaster home and wants the best for every athlete coming out of Lancaster High School. He was quick to give some Hall of Fame advice to those who might want to follow in his footsteps.